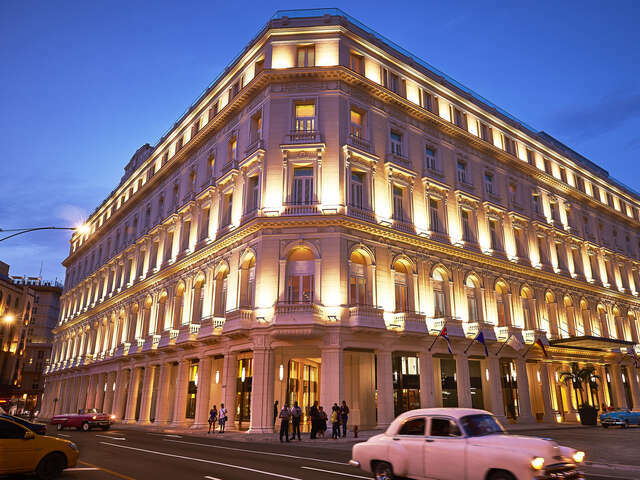 The Gran Hotel Manzana Kempinski La Habana has opened in Havana. It's the Cuban capital's first five-star luxury hotel, located in the heart of the UNESCO World Heritage site of Old Havana. And it is the first foray into the Americas for Europe's oldest luxury hotel group Kempinski. The hotel is a revival of an historic six-story colonnaded building begun in the late 1800's. It lived through various incarnations as Cuba's first European-style department store, a silent film theater, and later, government offices, slowly decaying like much of the historic architecture in isolated Cuba. Its re-imagination as a luxury hotel brings the Manzana building back to its glory days… and then some. 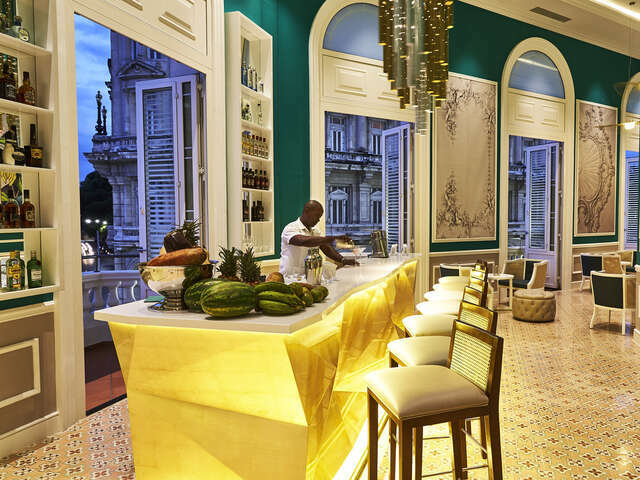 Now as a 246-room urban lifestyle hotel, the Gran Hotel Manzana Kempinski La Habana, with its whitewashed façade, is again a landmark and beacon of style in Old Havana. A cool, pale color palette, with vivid tropical hits of pinks, teals and purples, cements its design hotel credentials. Rooms all have ceilings 4-6.5 meters ( 13-20 feet) in height, contemporary furnishings and many have large French doors/windows perfect for admiring the patio and city views. Worth mentioning is the air conditioning and wi-fi, which, along with truly luxury levels of service, you can't take for granted in the up-and-coming tourism destination of Cuba. 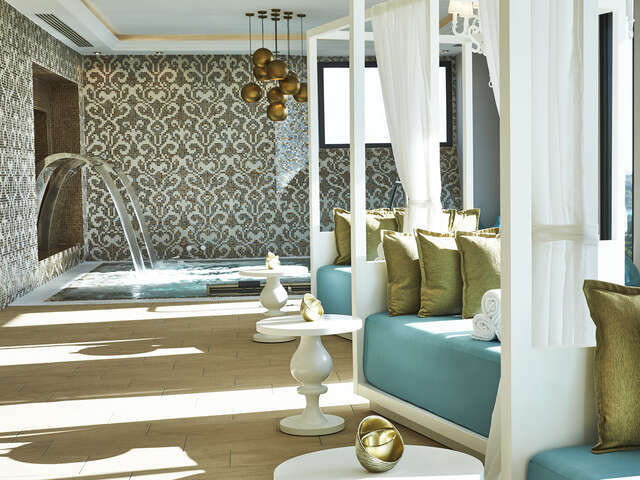 A 100 square meter (10,000 square foot) spa by Resense, and a business center round out amenities that include six bars and restaurants covering every whim of entertaining around the clock. When in Cuba, as they say… so of course there had to be a cigar lounge. You are guided through a Cuban cigar experience by a cigar sommelier who also suggests a perfect beverage pairing – with Cuban rum, naturally. And the spectacular roof top bar is the best place in the city for incomparable scenic vistas day or night over Old Havana’s Parque Central, and El Capitolio (a replica of the U.S. Capitol). The panoramic rooftop views are icing on the cake of this hotel that is at once majestic, high-style, and fun. The Gran Hotel Manzana Kempinski La Habana has reclaimed the building's position as a hub in the centre of the Old Havana. As Cuba continues its upward trajectory towards full-fledged modern tourism, it provides an international urban lifestyle hotel experience for that luxury group of travelers, visitors to its bars, restaurants and spa. It also sets a high bar for new arrivals on the luxury travel scene in Cuba's capital.